I spent our first twenty four hours in St. Lucia tearing through Joanna Blythman’s Swallow This, interrupting an otherwise serene scene of beach basking holidaymakers with regular exclamations of ‘did you know this?’ and ‘can you believe that?’ The fact that I was reading a book about the horrors of food processing and production on a 100 acre ex sugar plantation, surrounded by coconuts, mangoes and bananas (whose skin serves as much better natural packaging than any plastic ever will) was not lost on me. The book, in summary, is an investigation into what really goes into the food we eat. Not just the obvious ready meals, low fat foods and artificial flavouring most modern food conscious shoppers now know to avoid but also the chemicals used for processing which don’t appear on any ingredients list, the anything but ‘natural extracts’ listed even in organic products and the array of treated papers and plastics we insist on packaging it all up in. It’s an eye-opening read. Rather than dwell on those horrors today – I urge you to order the book then read it at your leisure – I want to celebrate the opposite end of the spectrum with a recipe inspired by our trip to St. Lucia. A place where mangoes hang ripe on the trees, where chocolate and coffee begin their lives as pods and berries and where a 65 year old man walks down the beach with a sack of fresh coconuts each day selling ‘the best water in the world’. This stove-top rice pudding is made using risotto rice and the risotto method, slowly stirring in coconut milk until each grain is plump and silky with just a bit of bite. 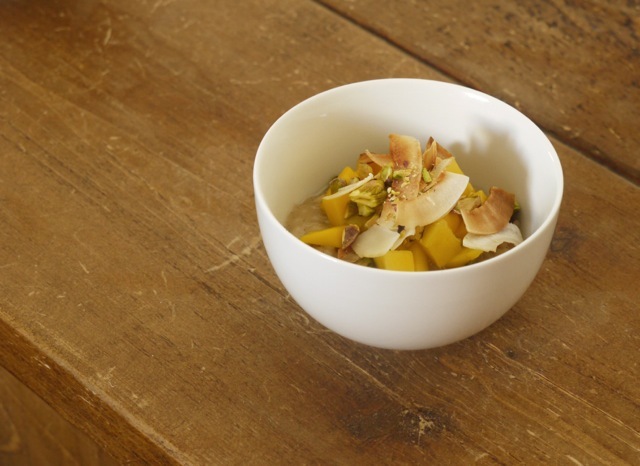 Brown sugar and rum add a caramel sweetness which is cut through with chunks of fresh mango* and toasted coconut flakes for crunch. It’s a simple little dish celebrating good ingredients and injecting a little bit of sunshine into a back-to-work week where I think we’re going to need it. In a medium saucepan, melt the coconut oil over a low heat. Add the vanilla seeds and rice, turn up the heat to medium and cook for one minute to coat the grains. Add the rum, continuing to stir until almost all the liquid has cooked away. Add the sugar and a splash of coconut milk and stir to combine. Continue adding the coconut milk, a little at a time. Stir regularly at a gentle simmer - as you would when making risotto - for 15 - 20 minutes until the grains of rice are plump and soft and the mixture is smooth and silky. Depending which rice you use, you may need to add a little extra water to achieve the perfect consistency. 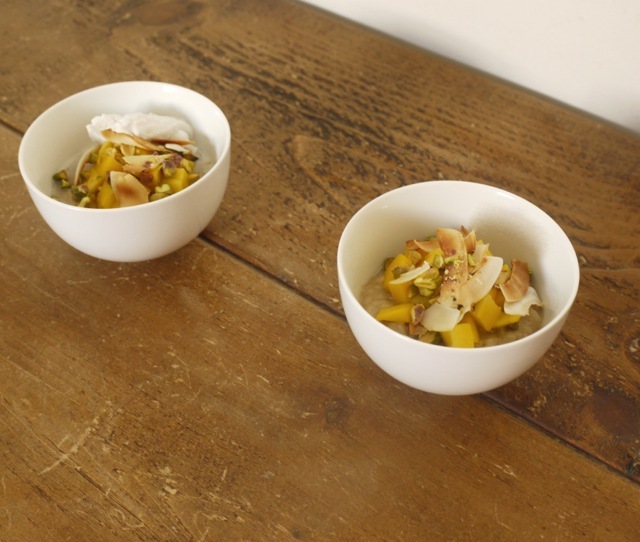 Divide the pudding between four little bowls and top each one with the mango, coconut flakes and pistachios. Serve warm or room temperature with a spoonful of whipped coconut cream, if you like. 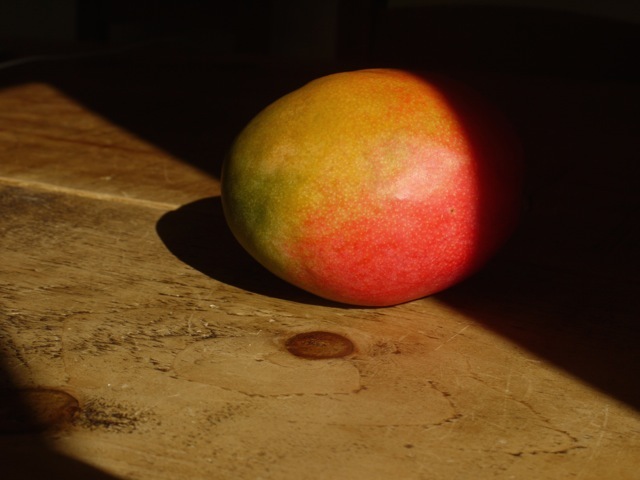 *because it’s in the spirit of the book, and someone will probably ask, mangoes in the UK are not without their problems. 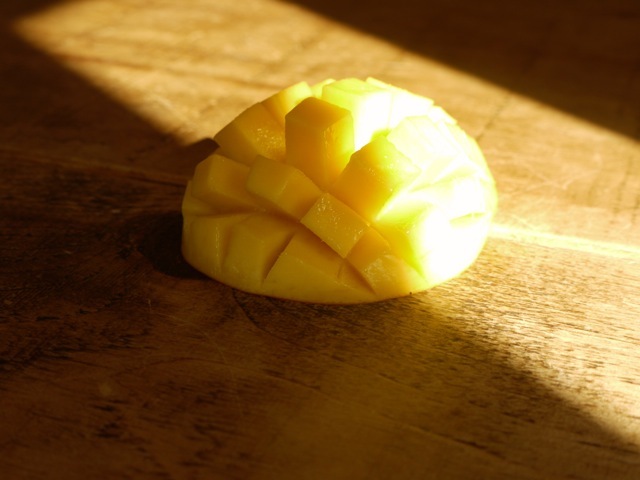 However, although there are food miles to take into account (a whole mango is likely to have arrived by boat, ripening on its way), with any luck it won’t have been injected, tampered with or processed in a way which will affect the flesh inside. Or so you would seriously hope. That sounds delicious, and definitely the way to inject some sunshine into your life. I just started the book on my tube journey this morning, and am already re-considering future supermarket purchases … and that’s from someone who prides themselves on eating natural, unprocessed and healthy food! This looks so summery and delicious! Makes me want to move somewhere tropical! I just starting Swallow This as well and I cannot believe some of the things I am reading. Like you I think I had a general awareness of what to avoid and thanks to a mother who is a wonderful cook not even uni days had me succumbing to ready meals. But it is shocking just how much goes on ‘off label’ with the food we buy! As for this rice pudding, I love the sound of the addition of rum – maybe not with my breakfast brown rice pudding but as a warming late winter supper, definitely! Isn’t it a fascinating read? I’ve been pressing it onto everyone I know! 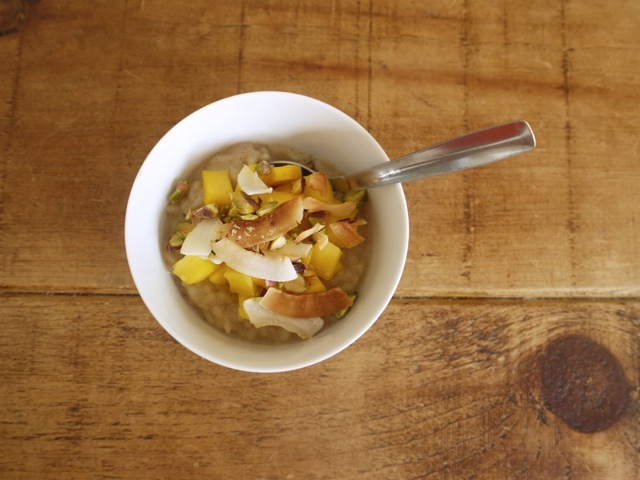 I love experimenting with rice pudding; it’s so easy to convey different flavours with the rice. I’ve never used coconut before though. I’ll definitely give something similar a go. Thanks! I am very curious about that book and will definitely order, so thanks for the tip. I love how you recreated your holiday in this dish. Incidentally, I have never made my kids rice pudding… must do! I’ve got that book in my bag to read over Easter – I’ve read some of the articles that she’s written and have been appalled at what I’ve seen so far + I’m sure the rest of the book is just as eye-opening. Anyway, this is a lovely tropical treat! Kate, I know this sounds decadent, but wouldn’t that beautiful pudding of yours be delicious for breakfast? Sounds like my kind of book, I’m off to take a look!